This continuing authoritative series deals with the chemistry, materials science, physics and technology of the rare earth elements. 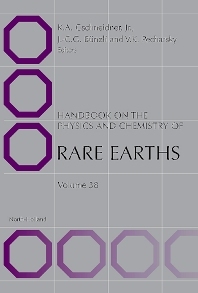 Volume 38 of the Handbook on the Physics and Chemistry of Rare Earth incorporates a recapitulation of the scientific achievements and contributions made by the late Professor LeRoy Eyring (1919-2005) to the science of the lanthanide oxides in which the lanthanide element has a valence equal to or greater than three. Gschneidner has published over 485 journal articles and chapters in books and edited or written 40 books on the chemistry, materials science, and physics or rare earth materials. He was the founder of the Rare-earth Information Center and served as its Director for 30 years. Professor J-C.G. Bünzli is a physical-inorganic and analytical chemist by training and an active researcher in the field of co-ordination and supramolecular chemistry of rare-earth ions. His research focuses mainly on designing self-assembled functional edifices containing rare-earth ions and with predetermined photophysical and/or magnetic properties. Professor V.K. Pecharsky is an active researcher in the field of structure-physical property relationships of rare earth-based intermetallic compounds. He co-authored over 250 papers published in peer reviewed journals and as chapters in books, holds 10 patents, mostly related to preparation and processing rare earth-based alloys.